The following is an OCR copy (to improve readability) of the original article on page 22-29 of the Feb. 9, 1998 issue of Chemical and Engineering News magazine, the weekly publication of the American Chemical Society. Cows first become agitated and apprehensive, then lose motor coordination. They begin to stand oddly, stumble, and hurt themselves. Their strange, seemingly compulsive movements make them seem “mad.” They have bovine spongiform encephalopathy (BSE), or mad cow disease. In England, cows have gotten it in epidemic numbers. Farmers there have had to destroy more than a million cows affected with or suspected of having the disease, with devastating effects on the beef industry. In people, changes in sleeping and eating patterns are the first signs of Creutzfeldt-Jakob disease (CJD). The disease progresses to fatigue and depression, goes on to cause coordination problems and difficulty walking, and eventually results in death. CJD is typically a rare disease of the elderly. But a new type of CJD that recently appeared preferentially targets young people. CJD and BSE are both transmissible spongiform encephalopathies (TSE5)— fatal neurodegenerative disorders characterized by deposits of protein aggregates in the brain. They have been proposed to be prion diseases—ailments transmitted by infectious proteins, rather than by viruses or other traditional infectious agents. But many researchers believe that insufficient evidence has been presented to prove this prion hypothesis conclusively. About a decade ago, suspicions began to arise that there was a link between BSE and CJD. In 1996, that suspicion was strengthened by experimental evidence, greatly increasing public awareness and anxiety about this class of diseases. BSE had apparently jumped the species barrier from cows to people. In the past few years, scientific attention has gravitated increasingly toward this once-quiet research area, with important new results being announced seemingly every week or so. “A lot of structural biologists and biophysical chemists are now working in this area, whereas four or five years ago virtually none were doing so,” says biochemist Peter I. Lansbury of Harvard Medical School. The 1997 Nobel Prize in Physiology or Medicine—awarded to neurology professor Stanley B. Prusiner of the Umversity of California, San Francisco, “for his pioneering discovery of an entirely new genre of disease-causing agents and the elucidation of the underlying principles of their mode of action” —was a capstone of recognition for prion research. This was, in fact, the second Nobel for TSE-related studies. Twenty-one years earlier, the same prize was shared by pediatrician and virologist D. Carleton Gajdusek of the National Institutes of Health for his work on kuru, another TSE. The study of the underlying cause of TSEs has been devilishly difficult, with many twists, turns, and complexities. Prion protein, the protein proposed to be the culprit, can exist in two structural conformations: the normal form (prion protein cellular, PrPC) and an abnormal form (prion protein scrapie, PrP~) that can cause disease. The question of how such proteins can be infectious is under intense debate. The structures of the different prion protein forms are just being determined. The normal function of PrPC is still unknown. Tools for detecting prions and diagnosing TSEs are scarce. And strategies for treating the devastating diseases prions are thought to cause are just beginning to be formulated. A long road lies ahead for those trying to fathom this field’s many remaining mysteries. Mad cow disease was first identified in England in 1986. Initially, only about 100 British cows showed symptoms of the disease, but its incidence soon became widespread. Kurt Wüthtich of the Institute for Molecular Biology & Biophysics at the Swiss Federal Institute of Technology, Zurich, agrees. “In my interpretation of the available data,” says Wüthrich, “the onset of the mad cow epidemic in Britain was most probably caused by the inclusion of beef contaminated by spontaneous BSE into the high-protein material that was used to feed cows.” In any case, as a result of the epidemiological study, the U.K. banned the use of protein from mammals in the feed of any ruminant animal. In the late 1980s, concerns arose that mad cow disease might also be a danger to people. Researchers began studying whether mad cow disease could jump the species barrier from cows to humans. Beef consumption in the U.K. dropped, and other countries considered banning imports of British beef. In 1996, neurologist Robert G. Will of the National CJD Surveillance Unit at Western General Hospital, Edinburgh, Scotland, and coworkers revealed that an alarming new variant of CJD had appeared between 1994 and 1995 in 10 people, nine of whom were under 35 years of age. More than a score of cases of new-variant CJD have now been identified in England, and one case has been reported in France. Classical CJD usually occurs in people over 65, and typically begins with progressive dementia accompanied by movement disorders. But new-variant CJD develops in younger people—age 29 on average—and usually begins with depression and other psychiatric symptoms. Dementia and impaired motor control of arms and legs follow later. The brains of deceased new-variant CJD patients exhibit characteristically large florid protein deposits that are different from those seen in classical CJD. In March 1996, the British government conceded that there could be a link between mad cow disease and new-variant CJD. It ordered that cattle infected with BSE, or even just exposed to it, be put to death. Cattle over 30 months old were also culled from the herds as an extra precaution. Meanwhile, the European Union banned imports of British beef and beef by-products. 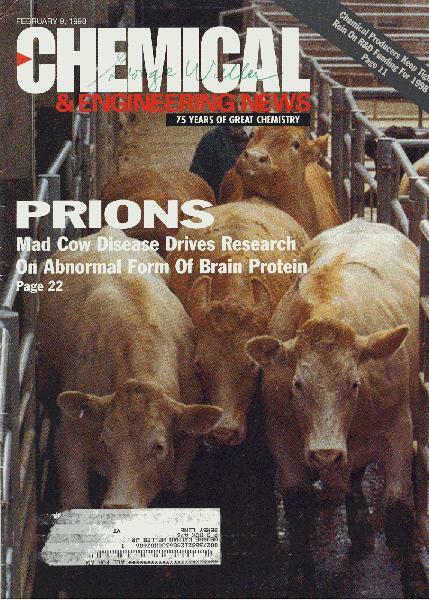 The link between mad cow disease and CJD was strengthened considerably in October 1996, when John Collinge and coworkers in the Prion Disease Group at Imperial College School of Medicine, St. Mary’s Medical School, London, developed biochemical fingerprints of BSE and CJD-associated prion proteins. Collinge and coworkers analyzed the proteins’ glycosylation patterns and the fragments generated upon treatment with protease. Their results showed that new-variant CJD was related to BSE and was distinct from all other forms of CJD observed previously. The findings suggested that mad cow disease had been transmitted to humans in the form of new-variant CJD—apparently as a result of people having consumed beef from mad cows. Also last year, a collaborative group including biochemist James Hope of the Institute for Animal Health, Will, Lansbury, and Byron Caughey of the National Institute of Allergy & Infectious Diseases’ Rocky Mountain Laboratories, Hamilton, Mont., showed that BSE prion protein can convert human PrPC to a PrPSc~like protein in vitro, albeit at low efficiency. “This suggests a low but finite inherent transmissibility of BSE to humans,” says Caughey. British citizens are especially fearful about the link between BSE and CJD because the incubation period for CJD ranges from 10 to 40 years. Hence, many people who are not yet showing symptoms of new-variant CJD may nevertheless already have been infected. In the U.S., reports about mad cow disease caused the Department of Agriculture to order the destruction of about 100 cows known to have been imported from Britain. The U.S. currently bans imports of cattle, sheep, and derived products (such as meat and bone meal) from all European countries. No British beef has been imported into the U.S. since 1989, and neither mad cow disease nor new-variant CJD has ever been detected in this country. List year, the Food & Drug Administration prohibited the use of most mammalian protein in animal feeds for ruminant animals such as cows, sheep, and goats—to prevent outbreaks of neurological diseases such as mad cow disease from spreading through feeds. But the rule permitted the inclusion in feeds of mammalian blood, blood products, gelatin, milk, and milk products and the inclusion of meat solely from horses and pigs, which are not known to have had TSEs. Consumers Union, publisher of Consumer Reports, urged FDA at the time to broaden the ban to one in which the feeding of all mammal protein to all food animals would be proscribed—the type of ban in place in the U.K. FDA upheld the exceptions, however. Because beef products also are used in processed food, cosmetics, and drugs, the EU recently proposed to ban imports of animal-derived materials such as gelatin and tallow from the U.S. and other countries, effective last month. Had this ban gone into effect, it would have stopped exports to the EU of medicines available only in the form of gelatin capsules. Pharmaceutical Research & Manufacturers of America (PhRMA), Washington, D.C., which opposes the EU ban, points out that taking three gel capsules a day for a year would yield a 1-in-100 billion chance of contracting CJD—one millionth the likelihood of being hit by a crashing airplane or being struck by lightning. There is a potential technological solution to the problem of ensuring that beef and beef products are noninfectious, but it’s a pretty radical one. “It should be possible to make prion protein knockout cattle” —cows genetically engineered to eliminate PrPC expression— “which would be guaranteed free of BSE for pharmaceutical purposes,” explains Weissmann. “It might be a wise precaution to undertake this,” he says, at least as a proof of principle—lest current measures prove ineffective at eliminating mad cow disease and the condition becomes endemic, as scrapie currently is. At first sight, TSEs appear to have all the hallmarks of viral diseases: they can be transmitted from one animal to another; the infectious agent can self-replicate; there are species barriers (restrictions on the spread of infection from one species to another); and there are variations in the patterns of disease symptoms caused by different strains of infectious agents. But the infectious agents in TSEs survive radiation, heat, and extremes of chemical treatment that normally kill viruses. And although viruses are composed largely of nucleic acids, numerous attempts to demonstrate that nucleic acids are a requisite component of infectious prion media have failed. The late Tikvah Alper, a radiobiologist at Hammersmith Hospital, London, demonstrated in 1967 that replication of the agent that causes scrapie did not depend on an intrinsic nucleic acid component. She believed that a lipid or a membrane fragment might cause scrapie and somehow propagate itself But this begged a question: How could such a substance replicate in the absence of nucleic acid? That same year, I. H. Pattison and Katharine M. Jones of the Agricultural Research Council’s Institute for Research on Animal Diseases, Compton, England, suggested that the scrapie agent consisted of “a small basic protein,” and math professor J. S. Griffith of Bedford College, London, proposed independently that a protein alone might be both infectious and self-replicating. Griffith described several possible mechanisms by which this could occur. “There is no reason to fear that the existence of a protein [infectious] agent would cause the whole theoretical structure of molecular biology to come tumbling down,” he wrote. In 1982, Prusiner and coworkers first isolated and characterized a putative infectious agent from scrapie-tainted brain tissue and proposed that it consisted of a protein, which they called prion protein. And in 1985, two independent groups—a team led by Weissmann (which included Prusiner) and another headed by Chesebro—discovered and characterized the complementary DNA for prion protein. The gene itself, Prnp, was then cloned by Weissmann and coworkers. Scientists now know that the same gene had, in fact, first been identified around 1970 by geneticist Alan Dickinson of the Institute for Animal Health. Dickinson showed that the gene, which he called Sinc, controlled the survival time of mice inoculated with an infectious scrapie agent. But he did not, of course, associate the gene with prion protein—which had not yet been discovered in 1970. The isolation of the Prnp gene in 1985 and the investigation of its expression showed that prion protein was present not only in infected animals, but also in healthy animals. It is an endogenous glycoprotein found on the membranes of brain cells and in many other tissues. The protein adopts two forms— normal and infectious. The normal form, PrPC, is soluble in water, susceptible to protease cleavage, and predominantly ct-helical in structure. The infectious form, PrP~, is insoluble and protease resistant, and it exhibits a higher proportion of f3-sheet structure. The deposits that form in the brains of TSE patients consist predominantly of infectious prion protein, PrP~. By sequencing prion protein, Hope and coworkers at the Institute for Animal Health were the first to get evidence that there is no difference between PrPC and PrPSC other than shape. Prusiner, UCSF professor of medicine and pharmacology Fred E. Cohen, and coworkers proposed independently that PrPSC was a shape variant of PrPC. According to their protein-only hypothesis of TSEs, PrPSc infects a cell and then somehow causes normal PrPC to convert into more PrPSC. Some patients with CJl) and all patients with two other TSEs—GSS (GerstmannStrilussler-Scheinker syndrome) and FF1 (fatal familial insomnia)—have mutations in their prion protein gene and can pass the disease to their children. In such cases—where there is no apparent infectious event that causes the TSE—Cohen and coworkers proposed that the gene mutations may destabilize PrPC, making it more prone to change spontaneously into PrP~, compared to nonmutated PrPC. Last week, UCSF physiology professor Vishwanath R. Lingappa, Prusiner, and coworkers reported the discovery of a new type of prion protein, CtmPrP (C-trans transmembrane prion protein) that is specifically associated with GSS. The protein-only hypothesis implies that PrPC has to be present for an animal to catch a TSE by infection—because if it isn’t present it can’t very well be converted to its conformational isomer, PrP~. Sure enough, Weissmann, neuropathology professor Adriano Aguzzi of University Hospital of Zurich, and coworkers reported in 1993 that knockout mice—mice whose PrPC gene had been deleted—did not catch scrapie when inoculated with PrPSC. Liter on, the researchers grafted normal PrPC~producing tissue into the knockout mice and showed that only the grafted tissue developed scrapie when infectious PrP~ was introduced. This experiment provided strong backing for the protein-only hypothesis. However, although it showed that PrPC is necessary to develop a TSE, it didn’t show that it is sufficient. Perhaps something else must be present as well. The existence of different TSE strains among other lines of evidence, suggests to some researchers that viruses or yinnos (small, nonprotein-encoding viruses) associated with PrPC are the real cause of TSEs. TSE strain variations affect the type of neurological damage incurred and the incubation time of the disease—the time required after infection before its symptoms appear. The virus or virino hypothesis holds that PrPC changes to PrP~ only in the presence of viral proteins or viral nucleic acid. Supporters of this hypothesis find it difficult to believe that a single protein can not only change its shape from “good” to “bad” but also adopt a range of additional structural variations, each resulting in a different disease strain. In their view, “protein only” doesn’t cut it. They note that viruses vary genetically, more readily accounting for the existence of TSE strains. Prusiner and other prion researchers reply that the viral hypothesis can’t easily explain how prions remain infectious even after they have been subjected to DNA- and RNA-killing treatments. They believe that strains are indeed caused solely by protein shape variations—that PrP5~ molecules or aggregates adopt not just a single infectious shape, but several. For example, they point out that prion protein is glycosylated in vivo and that diversity in the protein’s sugar groups could result in hundreds of different glycoforms of variable activity. So far, nobody has been able to come up with evidence that any TSE-associated viruses or virinos are essential factors in the diseases. But new viruses and virinos can be very difficult to identify, and prion researchers have failed to totally rule out the necessity of associated viruses or virinos because they’ve never been able to eliminate them totally from their experimental systems. So the debate between the prion forces and the virus-yinno camp continues. In a 1992 finding that lent support to the protein-only group, Richard A. Bessen (now at the department of medical micro biology and immunology at Creighton University, Omaha, Neb.) and professor of veterinary science Richard F. March at the University of Wisconsin, Madison, showed that PrP~ isolated from two distinct mink TSE strains had the same sequence but different protein conformations when propagated in hamsters. In 1995, a cell-free prion protein conversion system was used to demonstrate that the two strains of mink PrPSC (isolated in hamsters) could convert PrPC into two distinct sets of PrPSc~llke products. The latter study was carried out by Bessen, Caughey, Lansbury, and coworkers. And in 1996, Prusiner and coworkers showed that murine-human PrP could be converted in vivo into two different conformations of PrPSC, each corresponding to a PrPSc strain used to induce the conversion. These studies all suggested that distinct PrP structures could provide the molecular basis for TSE strains. The cell-free protein conversion system used by the Rocky Mountain Laboratories group had been developed there in 1994. Up to that time, researchers had only been able to demonstrate the PrPSc~induced conversion of PrPC to a PrP~-like protein in living cells—leaving open the possibility that viral components were mediating the conversion. In the 1994 study, Lansbury, Caughey, and coworkers showed that radiolabeled p~pC, when mixed with unlabeled PrPSc, could be converted to a radiolabeled 1)fl)Sc.like product in vitro. However, only a small amount of litbeled PrPSc was generated in the cell-free system, and it couldn’t be separated completely from the unlabeled PrP~ seed material used to induce it. So the researchers were not able to demonstrate that newly created PrPSc was actually infectious—a key test for the protein-only hypothesis. Additional support for the protein-only hypothesis has emerged from yeast and fungi, in which prionllke factors recently have been discovered. The findings point to the possibility that structural conversions similar to those undergone by prion protein may play an important role not just in disease but in normal biological processes as well. Geneticist Reed B. Wickner of the National Institute of Diabetes & Digestive & Kidney Diseases, Bethesda, Md., first proposed that protein-only inheritance of traits may occur in yeast. In 1994, he demonstrated that Ure2—a yeast protein unrelated to mammalian prion protein— could be converted into an improperly folded, inactive form. The defective form was heritable, and it was capable of converting additional Ure2 molecules to the altered state. Wickner suggested that an-other yeast protein, Sup35, might behave similarly, potentially representing a second protein-only heritable trait in yeast. Confirmatory evidence for the existence of yeast prions was reported in 1995 and 1996 by several groups—Wickner’s group; molecular genetics professor Michael D. Ter—Avanesyan and coworkers at the Institute of Experimental Cardiology, Moscow; biology professor Susan W. Liebman’s group at the University of Illinois, Chicago; and molecular genetics and cell biology professor Susan L. Lindquist’s team at the University of Chicago. For example, Lindquist’s group demonstrated that the defective form of Sup35 forms aggregates and induces normal Sup35 molecules to misfold. Last year, two independent teams— Wüthrich and coworkers and Lindquist’s group—went on to show that the defective form of Sup35 forms fibers that have the same staining properties and second-any structure as aggregate inclusions found in the brains of animals or humans who have died of TSEs. Lindquist and coworkers found that the formation of fibers from normal Sup35 is greatly speeded up by the presence of the defective form. In July of last year, Ter-Avanesyan and coworkers demonstrated that they could convert normal Sup35 protein into defective Sup35 by mixing the two types of protein in vitro. This was the first demonstration that a purified prionlike yeast product (the defective form of Sup35) could propagate itself, without the intercession of any other infectious agent— lending further support to the protein-only hypothesis and suggesting that yeast can be used to model prion phenomena. “The importance of the yeast systems,” says Wickner, “is that the evidence for prions in yeast is actually in some ways much better than the evidence in mammalian systems. There is evidence in yeast that the Ure2 protein is not just necessary but also sufficient to generate prions.” Lindquist adds that work on Ure2 and Sup35 suggests that the ability of certain proteins to confer heritable properties by changing their shape underlies other diseases or unexplained genetic phenomena and may be found widely in nature. As if to prove that point, evidence for another prionlike conversion—this time in a filamentous fungus—was reported last September by Virginie Coustou, Joel Begueret, and coworkers at the Institute of Biochemistry & Cellular Genetics of the National Center for Scientific Research (CNRS), Bordeaux, France. The protein they discovered does not per se determine an abnormal or diseased state in the fungus, but it triggers (in conjunction with the protein product of the alternate allele of the prion-encoding gene) a controlled cell-death reaction termed heterokaryon incompatibility. The precise three-dimensional structure of mammalian prion protein recently has begun to come into focus. In 1996, Wüthnich, molecular biology professor Rudi Glockshuber, and coworkers at the Swiss Federal Institute of Technology first reported partial structures of PrPC. And last year Wüthrich, Glockshuber, and coworkers obtained the first nuclear magnetic resonance solution structure of full-length PrPC. The NMR structure shows in detail the three ct-helices and the antiparallel fl-sheet in the carboxy-terminal half of PrPc. It also reveals that a nearly 100-residue polypeptide segment at the amino terminus of PrPC is “flexibly disordered” (random in structure). Wüthrich believes ( part of this unstructured and highly flexible polypeptide segment folds up in the p~pC~to p~.pSC conversion process to form the increased b-sheet content of PrPSC. The amino terminus of PrPC is the part of the protein that changes most profoundly during the conversion. Researchers also are endeavoring to decipher the normal function of endogenous prion protein in the brain. “By virtue of its location at the outer surface of cells, anchored by phosphatidylinositol glycolipid, prion protein is a candidate for a signaling or (less likely) transport function,” note Aguzzi and Weissmann. Last year, Hans Kretzschmar of the department of neuropathology at the University of Gottingen, Germany, and coworkers reported that the role of PrPC may have something to do with copper transport or storage. They showed that the amino terminus of PrPC contains about a half-dozen sites that bind Cu2~. In addition, two lines of mice whose Prnp genes were removed (making it iim possible for them to produce PrPC) have an abnormally low amount of copper in their brain cell membranes. The findings suggest that prpC may, in effect, be a copper metalloprotein. Is it just a coincidence, Kretzschmar and coworkers wonder, that monoamine oxidase, amyloid precursor protein, and superox amino terminus. ide dismutase-1 —proteins implicated in other neurodegenerative diseases such as Parkinson’s disease, Alzheimer’s disease, and amyotrophic lateral sclerosis—are also copper-binding metalloproteins? Another unknown is the molecular mechanism by which PrPC changes into p~pSC There are two competing models. The template assistance (or heterodimer) mechanism was originally proposed by Griffith and was later amplified by Prusiner and others. It proposes that mixing PrPC monomer with PrP~ monomer leads to the formation of p~pC~p~pSc heteroSc dimer, which rapidly converts to PrP homodimer. The homodimer may then dissociate, releasing new PrPSC monomer. The alternate model is the nucleated polymerization mechanism. It was also initially proposed by Griffith, was expanded on considerably by Gajdusek, and has recently been refined by Lansbury. It proposes that PrPSc oligomer or polymer acts as a “bad seed,” inducing the recruitment and consequent refolding of PrPC. Some researchers also believe that molecular chaperones—proteins that promote folding of other proteins—play a key role in the refolding process, but this is currently an area of great uncertainty. Based on evidence from the propagation of PrP~ in transgenic animals, Prusiner, Stephen DeArniond of the UCSF department of pathology, Cohen, and coworkers proposed in 1995 that a chaperone—tentatively named protein X—may bind to PrPC and facilitate PrPSc formation. In 1997, they went on to identify an area on PrPC to which protein X may bind. They believe this area controls the conversion of PrPC into PrP~ and also controls the transmission of prions across species. A discrete binding site for protein x in the three-dimensional structure of PrPC has also been identified independently by Wüthrich and coworkers. In 1996, Famulok, Winnacker, prion research group head Stefan Weiss, and coworkers at the Laboratory for Molecular Biology— Genzentrum of the University of Munich showed that Hsp6O (heat shock protein 60), the human homolog of the bacterial chaperone GroEL, binds specifically to prpC in vitro. The researchers identified the location of chaperone binding as a region of PrPC in which major structural changes occur when the protein is converted to PrPSc. In a collaborative study with Caughey’s group, Lindquist and coworkers found that both Hsp 104 and the chaperone GroEL promote conversion of PrPC, in the presence of PrP~, to a protease-resistint PrP~~c~like polymer. The conversion does not occur in the absence of PrP~— demonstrating, they say, the importance of PrPsc as a template for PrPC conversion. Two groups of scientists recently found cell receptors that also may be involved in the transformation of PrP into PrPSc. The work was reported independently last year by groups led by Ricardo R. Brentani at Ludwig Institute for Cancer Research, São Paulo, Brazil, and Weiss at the University of Munich. Brentani and coworkers used an immunologic strategy to ferret out a membrane protein as a receptor candidate. Weiss and coworkers, using a technique called a yeast twohybrid screen, identified another cell-surface protein as the cellular receptor of PrPC. The groups don’t yet know if the receptors are related to each other and they can’t say for sure that either of the receptors is the major physiological receptor for PrPC. A prominent prion researcher whom C&EN asked to comment on the studies (but who requested anonymity) said they were “very intriguing but, in my view, both somewhat preliminary.” But the Brentani and Weiss groups believe their work could lead to therapeutics, because inhibitors of PrPC~receptor interactions may act as anti-TSE agents. Other studies have focused on the route of prion infectivity in the body. Last year, Aguzzi, Weissmann, and coworkers found that scrapie prions introduced into mice by peritoneal injection accumulated in the spleen. They believe the scrapie infection most likely traveled from there to the brain via peripheral nerve cells. There is some precedent for this, as rabies and herpesvirus are already known to spread through the peripheral nervous system. Unfortunately, the only way to confirm a TSE diagnosis in people has been to take a biopsy of brain tissue, which requires dangerous brain surgery, or to conduct a postmortem examination. But better diagnostic tests may finally be on the way. In 1996, Clarence J. Gibbs Jr. of the Laboratory of Central Nervous System Studies at the National Institute of Neurological Disorders & Stroke, Michael G. Harrington of the department of biology at California Institute of Technology, and coworkers announced a test of spinal fluid that could detect CJD with 96% accuracy. The test was based on the 1986 discovery by Harrington and coworkers of a protein that was believed to originate in affected brain cells. The procedure also can be used to diagnose BSF in cows. By screening a combinatorial RNA IIbrary, Weiss, Kretzschmar, Famulok, Winnacker, and coworkers identified PrPC~ binding RNAs for potential use in a diagnostic assay for TSEs. “We are currently investigating whether PrPC~speciflc [RNAs] are able to reduce or even neutralize infectivity,” says Famulok. In addition, a monoclonal antibody that could discriminate for the first time between prpC and PrP~ was identified last year by prion researcher Bruno Oesch and coworkers at Prionics A.G. at the University of Zurich. Oesch believes the antibody will be useful for diagnosing TSEs in animals and humans and also for concentrating PrP& from tissue samples. Formerly, PrP~ could only be detected in tissue by a tedious procedure involving protease treatment. With the antibody technique, PrP~ can be detected without any need for protease digestion. Last December, Prusiner, DeArmond, Cohen, and coworkers also reported the development of genetically engineered test mice that respond more rapidly to mad cow disease prions than normal mice do. They genetically engineered the mice to express bovine p~pC instead of mouse p~pC When infected with cow prions, the test mice develop disease symptoms more quickly (within 250 days) and more consistently than do normal mice. They could thus potentially improve the capability to screen human food, cosmetics, and medicinal products for infectious prions. However, 250 days is still a long time to wait for the results of a diagnostic test. Perhaps the most important long-range priority in prion research is the effort to develop therapeutic agents to treat those who are exposed to or who come down with TSEs. Because the incubation time of human TSEs is many years, there is ample time available after infection occurs to use therapeutic strategies to intervene in the disease process. Potential therapies could involve inhibiting PrP -toPrP conversion or interfering with the infectious route PrPSc takes in the body. For example, Caughey says his group “has published several papers describing potent inhibitors of the conversion and scrapie agent replication—for example, Congo red and various sulfated glycans. Other groups have shown that these and additional compounds, such as amphotericins, can prolong the lives of infected animals. This work provides a solid lead toward therapies.” At a more basic level, researchers still hope to learn how PrPC~toPrP~ conversion causes disease. They want to determine the molecular mechanism of PrPSc toxicity And they’d like to understand the relationship between TSEs and other neurodegenerative diseases. The folowing article is from C&E News September 18, 2000, page 15. Cellular prion protein (prPC), a naturally occurring protein found on surfaces of nerve cells in the brain, is known to be able to convert into a structural form associated with transmissible spongiform encephalopathies (TSEs)-diseases such as scrapie in sheep, mad cow disease in cattle, and Creutzfeldt-Jakob disease in people. But despite long-standing efforts, researchers have not been able to determine the normal role this important protein plays in the brain. A French research group has now overcome that hurdle, finding that PrPC is a component of a cell-signaling pathway [Science, 289, 1925 (2000)]. The team was made up of graduate student Sophie Mouillet-Richard and Director Odile Kellermann of the Laboratory of Cellular Differentiation at Pasteur Institute, Paris; Jean-Marie Launay, head of the biochemistry laboratory at Lariboisiere Hospital, Paris; and coworkers. 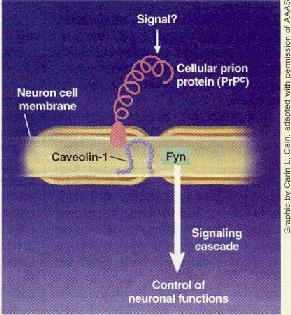 In the signaling process, PrPC inter- acts with a protein called caveolin-1 and then activates a tyrosine kinase called Fyn. A protein called clathrin may also be involved in the pathway, but that’s uncertain at this point. The overall function of this signaling pathway is still not known, but its discovery should help researchers attain a better understanding of Prpc and its role in TSEs. “Everybody suspected that PrPC was a signaling protein, but nobody really predicted it There is no question that this is the first clear-cut evidence of signal transduction by Prpc,” comments Adriano Aguzzi, a professor of neuropathology at University Hospital, Zurich, who specializes in neurodegenerative diseases. A direct route to the function of a protein is to determine the effects of the protein’s absence in “knockouts”- organisms genetically engineered to be incapable of expressing the protein. But when researchers developed PrPC knockout mice, they were surprised to find that the mice developed normally and exhibited only relatively minor neurological problems. These experiments thus left the protein’s function unclear. A few years ago, a group led by neuropathology professor Hans A Kretzschmar, now at Ludwig Maximilians University, Munich, Germany, hypothesized that the role of PrPC might have something to do with copper transport or storage. The researchers showed that PrP’ binds Cu2+ and that the nerve cells of PrP’ knockout mice had ab- nomla1ly low levels of COp” per. But the findings did not provide any definitive evidence for such a functional role. In the current study, the French researchers began with the assumption that PrP’ was a signaling protein. Using specific antibodies to PrP’ to mimic the activity of a putative endogenous activator, they found that activated Prpc interacts with caveolin-l and that this complex passes the signal along to Fyn. as-yet-unidentified membrane-spanning molecule may serve as a signaling intemlediary between PrP’ and caveolin-l and Fyn. “1 would love to learn what is the miss. ing link, because topologically there is simply no way PrP’ and Fyn talk to each other directly,” he says. larger signal transduction cascade, and they do not yet lmow the pathway’s overall function. But Kellennann tells C&EN her current best guess is that it might in- volve fine control of neuronal homeostasis. She hopes future work by her group will eventually be able to fill in this and other details on PrPC signaling.